Whenever venerable American metallers Iced Earth release an album, it makes our ears prick up. Not so much because every Iced Earth release is a revelation, but moreso because we keep hoping each release will harness that greatness we all loved back in the mid-’90s, when they were churning out great albums like Burnt Offerings, The Dark Saga and Something Wicked This Way Comes – three albums all of us should own. 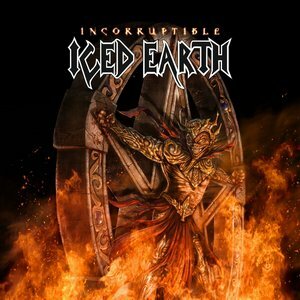 Incorruptible is the band’s 12th album, and finds Iced Earth treading familiar water, with the band’s strengths and weaknesses both on full display. Opening track “Great Heathen Army” is one of the standout cuts on the record once past the pagan chants, featuring a locked-in rhythm section, stellar guitar work, and Stu Block’s powerful vocals in all their glory. These technical features are constants throughout Incorruptible. Brent Smedley on the skins and Luke Appleton on bass anchor each song with a rock-solid foundation, never overplaying as they let the other three take center stage. On guitar, founder Jon Schaffer’s play has not wavered in nearly three decades, with impeccable tone, chunky rhythm work and lightning leads. Here he is joined by newcomer Jake Dreyer, who more than holds his own, trading licks with abandon. It’s a lethal combination sure to please Iced Earth’s fans. On vocals, Stu Block remains his over-the-top self. With a list of influences that consists of basically every singer ever (including former Iced Earth frontmen Matt Barlow and Tim Owens), his style is all over the map. When he’s good, he’s the best, and when he’s bad, well, we may as well have Jack Black on the mic. “Great Heathen Army” is an example of Block nailing it, with Halford-like wails and Barlow-like growls. On the flipside, the pirate-themed mishap “Black Flag” has Block vocalizing so over the top it’s laughable. Reining in the theatricality would be a good thing for such a talented singer. So we’ve established that talent abounds in Iced Earth: what’s the problem with Incorruptible, then? The same problem that has dogged Schaffer and his crew for nearly 20 years now: songwriting. Simply put, the band can’t put together a record with more than three or four standout cuts any more. For every “Great Heathen Army,” “Raven Wing,” or album closer “Clear the Way” we’re left with two missteps, the worst of which include the aforementioned pirate ditty (just give me more Alestorm, please) and the poorly thought-out instrumental “Ghost Dance,” which for some misguided reason features a lot of Native American chanting. Ugh. All told, Incorruptible is most likely to please Iced Earth’s existing legion of fans, while not winning over any new ones or making old-timers hoping for something on par with the band’s ’90s input jump for joy. It’s an okay album of power metal with a few good cuts, a few duds, and a bunch of filler. Schaffer has a great band around him now, he just has to find a way to transmutate all that talent into great songs.